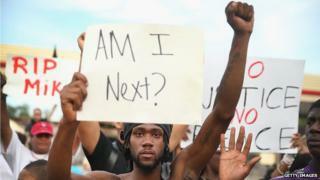 The US Justice Department has found evidence of racial bias at Ferguson police in Missouri, US media report. The agency is expected to accuse the department of conducting stops without reasonable suspicion and making arrests without probable cause. It began a civil rights investigation following the August shooting of Michael Brown. A white police officer killed the unarmed black 18-year-old, sparking protests in Ferguson and nationwide. A separate report is expected to clear the officer, Darren Wilson, of any civil rights violations in the shooting of Mr Brown. Officials announced the findings of the investigation into the police department by speaking anonymously to various US media. An official announcement is expected on Wednesday. Attempts to seek comment from the police department and city government were not successful. A spokesman for the Missouri governor said: "We haven't seen the report to be able to comment on it." It is believed the report will accuse the police of using excessive force against blacks and present evidence that black motorists are stopped and searched without reason. While African Americans make up 67% of the population in Ferguson, they accounted for 93% of arrests between 2012 and 2014, according to the Washington Post. The report will also present evidence that the courts also engage in racial bias - blacks are 68% less likely to have their cases dismissed by a judge. Investigators also found that officials used money from fines to help balance the city's budget, the New York Times reported. The Justice Department could file a civil rights lawsuit, if officials do not settle the claims out of court. The protests about police use of force were reignited when a Missouri state grand jury did not recommend charges for Mr Wilson. Shortly after the grand jury decision, President Barack Obama said the protesters' frustrations, "have deep roots in many communities of colour who have a sense that our laws are not always being enforced uniformly or fairly". The civil rights investigation was announced in September 2014 by Attorney General Eric Holder, the Justice Department's first black leader. In October, he said the Ferguson police department needed "wholesale change".